It's official, I'm sick. It feels like someone took a piece of sandpaper and started dragging it from my tonsils to my lungs. I should form a Tom Waits tribute band or something. Nothing to do about it now except hope it goes away quickly, and I really hope that I am in decent shape by tomorrow. I am so looking forward to the Mardi Gras ball, so it will make me sad if I feel awful during it.. I was really hoping that I could avoid getting sick this year since the last 3 years I've had borderline SARS, usually around my birthday. So totally different subject, what the hell is going on with journalists this week? The Brian Williams lying/suspension thing has been a huge bummer because I truly liked him, then Bob Simon getting killed was a mega bummer, and now David Carr has died. All in one week? Sheesh. I feel like I need to make a prayer circle around Charlie Rose and Scott Pelley, just in case. I love Scott Pelley (or Pells as he's known in our household) because he constantly has a little twinkle in his eye, and often gets the feels to the point of tearing up if he's covering a very touching story. He's a great journalist too, I just like that he has a heart. He did a great piece on CBS This Morning about Bob Simon and you could tell he was struggling to get through it. I like Charlie Rose because he's not only an amazing journalist, but you can also tell he really doesn't like Gayle King and makes veiled snatchy comments to her AND I've caught him rolling his eyes when she says stupid things, which always makes me do an inner fist pump. I feel like Charlie and I could get together for martinis in a dark New York bar and talk about how annoying she is. Anyway. Now I know some of my lovely people are on a no sugar thing this month. I am advising you to LOOK AWAY for a couple of paragraphs if you feel like you will be tempted by treat pictures. I have to admit, I don't get why everyone gets their bra straps twisted in excitement about pumpkin spice everything, pumpkin doesn't do a ton for me, so the pumpkin spice thing is not something I personally gravitate towards. And honestly, I don't get very excited for doughnuts either because they usually give me raging heartburn due to them being fried. However, these are pretty heavenly. A couple of years ago Eric and I went back East to visit my in laws during the fall, and we all went to the pumpkin patch/cider mill that Eric remembered fondly as a kid. In addition to the best apple cider I've ever had, there was a stand with pumpkin doughnuts (fried of course) that were some of the best doughnuts I've ever had. These are very, very similar but much lighter. Lighter is a good thing. There is cinnamon, allspice, nutmeg and cloves in the batter, so the smell these emit while baking is otherworldly. 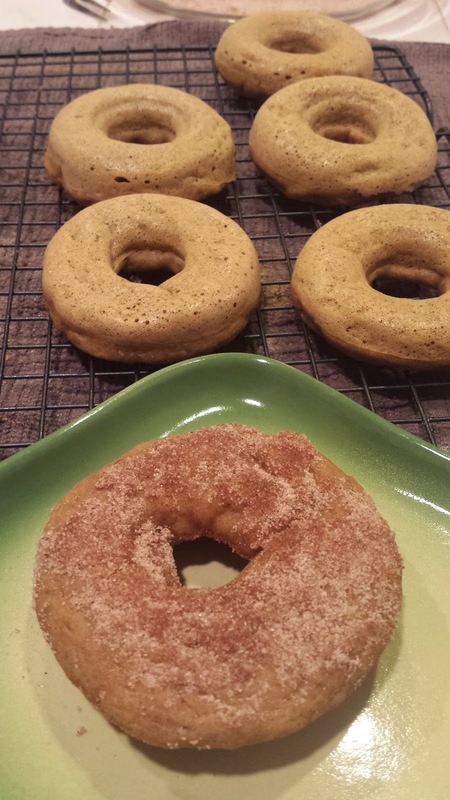 Those same spices give a really lovely warming sensation on the palate, and the pumpkin/apple sauce make the doughnuts plenty tender and spongy without the oil. Highly, highly recommend them. And even better, now I have a doughnut pan and can test all kinds of baked doughnuts that won't make me question my life choices! Well, since my croaky voice made me have Mr. Waits on the brain, I wanted to leave you with the stellar version "Tootie Ma" by the fabulous Preservation Hall Jazz Band and Tom Waits. We're so close to Mardi Gras! The heartburn is what turns me off of doughnuts, but without the oil or being fried, these gave me no issues of course. If you're into pumpkin spice, these will definitely blow your skirt up. I love warm spices so these really did it for me. The house still smells amazing from it! And another doughnut tip. If you are ever in Portland, for God's sake don't fall for the Voodoo Doughnut trap. Worst doughnuts ever unless you like to wait 30 minutes to an hour for mediocre doughnuts with stale cereal on them. Mmmmm, these look freaking good! I definitely am not a huge "normal" doughnut person, but really like the cakes ones. This is more like a cake doughnut. They were pretty spongy just because of the pumpkin/apple sauce, but I liked them. I can't wait to try all kinds of baked doughnuts now that I can make ones that aren't unhealthy and make my stomach hurt!